Today the MOD announced the third round of Army job cuts and up to 5300 jobs are to go. So this means that lots of Army guys will be looking for a new life outside in Civvy street. I was in the RAF for 13 years and I too was made redundant in 1996. Back then I really wanted it, and in fact we all wanted redundancy because it meant a good pay out (mine was £46,000) and your pension straight away and for the rest of your life (the pension isn’t that great). So on the day I can remember excitedly going to see my flight commander to get the envelope that contained the “bluey” to say that I had been made redundant. I had already been accepted for Teacher training but I decided not to take up the offer preferring to ‘chase the money’ and I went into contract work which meant that even though I got “loads of money” it meant a life of boredom and unfulfillment. So why am I telling you this on my blog when looking back one of the other things I considered buying was a franchise. In fact they are still around a carpet van that goes around to peoples homes and sells carpets door to door. Well I glad I didn’t buy that as selling wouldn’t have been my strong point then. I’m better now but I’ve had a few years experience. But really I think if back in 1996 I had looked a businesses a bit harder and would have found something that I enjoyed doing, so maybe something like oven cleaning, something hands on that required some physical effort. So would I have considered oven cleaning back then? Maybe though in 1996 it would have still be a very new concept and the market wouldn’t have been large enough. Today the market is accelerating upwards (see www.google.co.uk/trends and put in “oven cleaning”) and it’s a different proper market with huge potential. In the last eighteen months here in Bristol three new oven cleaning franchisees have started in the last eighteen months – 2 Ovencleans and 1 Ovenu. Has it affected our business ? Well no. We have a clientbase of over 13,000 to market too, in addition to other things we do. So if you are on the bad end of the Army Job Cuts then there may be a brighter future out there for you. We are going to be at the National Franchise Show on 22nd and 23rd February at the NEC. Come and see us to get my free book. We clean AGA cookers cold and this is the method we have used since I started in 2004. I have done a few hot but not more than three or four. I have usually cleaned them because I didn’t want to waste my time and the clients time. It has been okay on all the occasions that I have done this from what I can remember and the clients have been happy with the end result, but I know that really that I would have had problems cleaning to the standard I would have done had they been cold and I can certainly remember burning myself. But I do know of companies that clean them hot. I think it is something you’d get used to and would be helped with with a pair of those lovely silicon gloves that I’ve seen in our local AGA shop. 1. Do you do take off the rings around the top plates and if you do how do you do this? Do I pick them up with pliers and if I do where do I put the hot ring? If I don’t take off the ring do I really have to worry about any build up around the ledges under the rings? 2. Cleaning the inside of the lids; I can remember that this was difficult because of way that the steel wool heats up. The solution with the gloves would solve this. 3. Cleaning the tunnels and the doors – I remember I took the doors off and they cooled down pretty quickly and I was able to clean them as I usually do. But the tunnels are still going to be difficult to clean if they are encrusted in years of burnt on carbon. 4. Cleaning the racks – again they are going to be hot so where do you put them? 5. Cleaning the flue cover. Again it could be put to one side to cool and then you could clean it by hand, but I usually dip them to get the perfect result. 6. 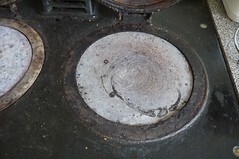 Cleaning the flue itself – how would you do this if the AGA was hot? The flues are difficult to clean when the AGA is cold so cleaning them hot would be worse. 7. Cleaning the enamel tops when they are really thick in grease or burnt carbon. Really you’d need them to be cold to achieve the results that we get. So for me cleaning cold is the way to go. But if you clean the hot good luck to you. P.S See us at The National Franchise Exhibition at the NEC 22 and 23rd of January 2013.
posts during December but they never got to the site as I had a problem with my phone not working properly and they never got anywhere. What happened was one of our guys went sick with the sickness bug. So I had to go out cleaning ovens; my first day was a nightmare with two really dirty ovens, people seem to leave them for Christmas cleaning, and after that I thought that it would be it just a couple of days cleaning and then back into the office for the run up to Christmas but NO when he was well again to work one of the other guys went sick with ‘Man Flu’ so my wife called it 🙂 but it got a bit more serious the week after and turned into Bronchitis and he had to take some medicine for that, so I worked on all the way up to Christmas. I did lots of ovens and a couple of AGAs and I did enjoy it in the end, it just took me a while to get back into my old routine. At Christmas time we are very busy and we are booked up a couple of weeks in advance and really we can’t let anyone down. For the last Christmases we have filled up the vans and then booked in any over spill into me to do, but this year it didn’t work out that way. But of course I can’t really complain as even though we had tons of water we didn’t get snow which in the past has stopped us getting to houses. Well, anyway, here we are with the first post of 2013. I have been trying today to turn this blog into a book. But the software I used to convert it has told me that it has 113,000 words and would turn into a book of 734 pages. So I am going to have to do some editing and I probably end up with three books of about 25,000 words each. But I need to do find the time first. But look our for them, if you signed up to my lists then I send you the details. This weekend we are holding our AGM for OvenGleamers and if you would like to come along and meet us and the franchisees – they will all be there – (the invitation is open to all those on my email lists) please contact us in the office. 01275 370571.